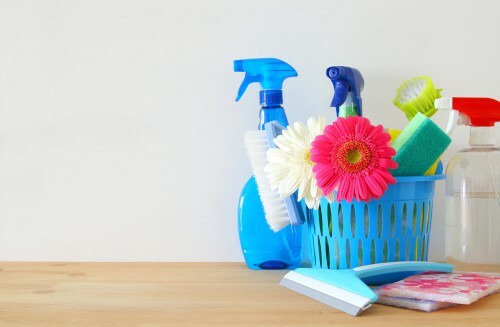 You know it’s time for spring cleaning when all the dirt piles up on your floor and walls, when you see the formation of thick specks of dust on your glass windows, on your furniture and even on your appliances. And I know how tiring it can be to be moving around house items just to make sure that your house is fully clean. Sometimes it may take an entire day to finish cleaning. Now isn’t the time to be lazy. As exhausting as it may sound, the result of Spring Cleaning is worth all the efforts. Homeowners can benefit so much from living in a clean house. For example, if the house has no trace of food debris on the floor, nothing will invite pests and insects inside the house. But how can we achieve a healthier home while cleaning? Here are 10 spring cleaning tips to help you. When you’re cleaning, make sure that you follow a pattern when cleaning. This means that if you’re cleaning the entire house, then you need to start from the ceiling down to the floor. It just doesn’t make sense to start cleaning the floor and then dust the furniture and clean the floor again. You shouldn’t be spending too much time to clean the same spot over and over again. What will work is by using a systematic pattern. Start from the top then move to the bottom. After that, clean from the left then move to the right. It is recommended that you always start cleaning the ceiling first. After that, work your way to the walls. Then clean the windows and then the furniture. The floor should always be the last to clean. Once you already have a pattern to follow, then you should also apply this per room. Follow the top-bottom, left-right cleaning pattern in one room and make sure it is all clean before moving to the next room. This plays a very big role in making sure you’re efficiently cleaning your house. You should not leave any trace of unfinished business before you proceed to the next room. When cleaning your windows, you don’t always have to use liquid cleaners or sprays. You can use clean water and clean toilet paper. Just soak the toilet paper in a water and wipe the window with it. Then use another toilet paper to completely clean the window. The glass windows should look so clean after this. Cleaning the kitchen floor is often the most annoying part, especially if you haven’t cleaned it for days. The best thing to work on the floor is to use homemade floor cleaners. Hot water and a little bit of liquid soap are always the go-to for linoleum, granite, tiles, and marble floors. Your kitchen floor should be clean in no time! You should know that the mattress absorbs all dirt. It may not look as dirty as it seems but it’s one of the dirtiest parts of your home. It has all the dust, dried sweat, dead skin cells, and all other tiny dirt. There’s a special type of vacuum that is used to clean mattresses but it can be expensive. If you don’t have it, then you can always look for an alternative. For example, you can wash your mattress cover in a 60-degree Celsius every month and wipe the top of your mattress, too. Using chemicals in cleaning the drain is dangerous. Besides, they have this very bad smell, so you should stop using them. Instead, a healthy way to clean is by pouring one pot of boiling or hot water down the drain at least once per week. This will definitely help prevent anything from clogging your drain. Domex is one of the most popular products that can be used to sanitize and clean toilets. However, this is unhealthy. In this case, you can pour white vinegar into the toilet. Doing it once a month and leave it overnight because it cleans up the build-up of alkali. More importantly, it prevents the hard-water rings from forming in the toilet. Baking soda can also be an effective ingredient. The biggest home intruders are rodents and pests. If there are cracks and holes on the walls of your home, then that’s already a sign of a possible unwanted entry. What you should do is to start fixing the cracks or holes and getting rid of any food debris that might invite these pests. Also, check for clutter and make sure that you get rid of it. It’s a way to eliminate the rodents’ and pests’ source of shelter and food. Don’t use pesticides and chemicals as it may only cause more problems. For example, if a mouse dies because of poison, it will release a foul smell. What’s worse is when you don’t know where the smell is coming from. It’s important to make sure that your cleaning materials are properly arranged. For example, if you’re using a broom for cleaning, don’t stand it on its bristles after you’re done the cleaning. It will cause the broom to lose its effectiveness in cleaning because the shame will be destroyed. What you need to do is to buy a broom holder instead. If you’re using rags, make sure to clean the rags after you’re done using them. Some households don’t use electronic dishwashers. Most of them use sponges and liquid soap. According to research, sponges contains hundreds of millions of bacterial pathogens. These cannot be killed by pouring boiling hot water on them. Besides, you might only hurt yourself if you do it and squeeze the sponge, right? But here’s what you can do. Microwave it every day and leave it for 30 seconds. A friend once told me that happiness is being able to lay in bed with clean sheets. I could not agree more. If your house is all clean, then there’s a great chance you wouldn’t have any health problems. If you don’t have any health problems, then you’ll be happy and healthy.